President Obama and Hillary Clinton attend a Cabinet meeting at the White House in 2012. Clinton was then serving as Obama’s secretary of state. “Hillary Clinton is running for Barack Obama’s third term.” You’ve heard a version of that argument from many Republicans who want to tie Clinton to a president who isn’t all that popular. Democrats, on the other hand, have been split on whether Clinton should glue herself to Obama and his record. Clinton’s favorable rating has fallen into line with Obama’s. 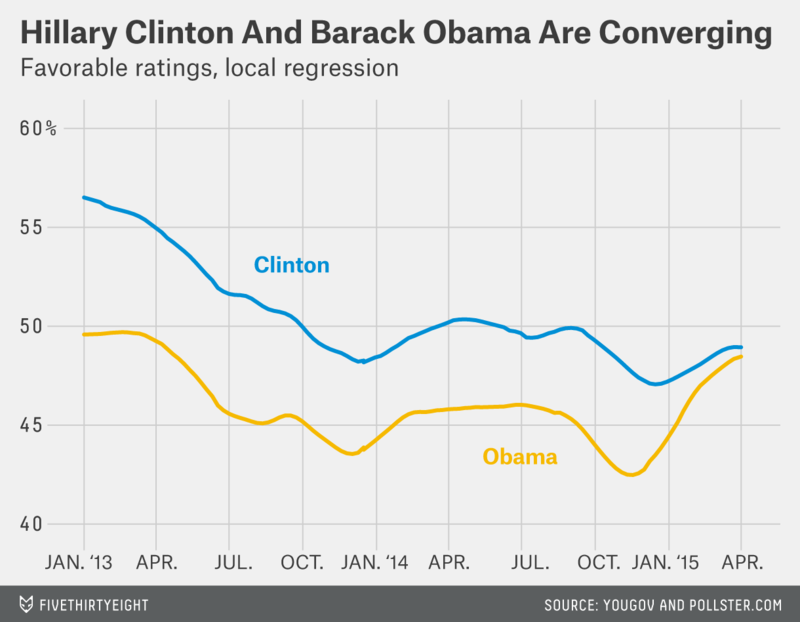 The latest local regression estimate puts Clinton’s favorable rating at 48.9 percent and Obama’s at 48.5 percent. And that understates the relationship. Even when Clinton’s favorable rating was stronger than Obama’s, the two generally fell and rose at the same time. The correlation between the two has been 0.79. Now the relationship is even stronger. YouGov breaks down the favorability ratings by age, gender, income, ideology, party identification, race and region. Over the past two weeks, Clinton’s favorable rating in each of these groups mirrors Obama’s. 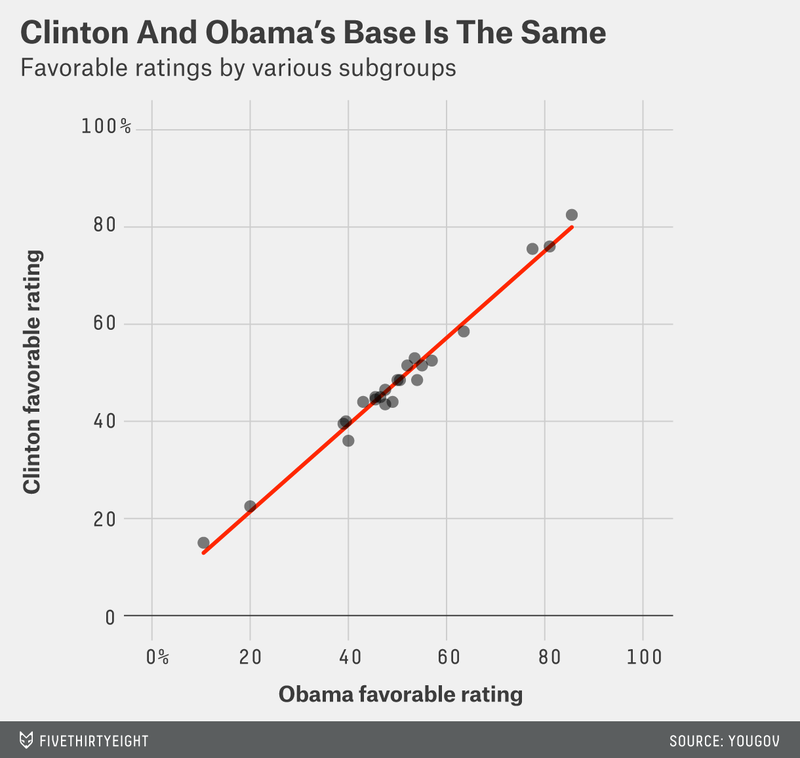 The average absolute difference between Clinton’s and Obama’s favorable ratings for the groups is just 2.6 percentage points; the median is just 2 percentage points. Keep in mind, all these differences are within the margin of error. The correlation between Clinton’s and Obama’s favorable rating in these 23 demographic groups is 0.99. Clinton simply doesn’t seem to have a different base of support from Obama. And that’s par for the course historically. It’s difficult for a nominee of the same party as the sitting president to run away from that president. The favorability ratings of the nominee and the incumbent president rarely differ by more than a few percentage points. Let’s go through all the elections in which a sitting president didn’t run for re-election. We’ll start with 1960, the first year for which we have favorability ratings. On the eve of the 1960 presidential election, Gallup found that President Dwight Eisenhower and Vice President Richard Nixon (the GOP’s nominee that year) — two very different politicians — had nearly equal favorability ratings: 83 percent of Americans gave Eisenhower a positive score on a 10-point scale, compared with 79 percent for Nixon. Eight years later, in 1968, President Lyndon Johnson’s approval ratings were so low that he decided not to run for re-election, although he still did fairly well on personal popularity. By the end of the campaign, Vice President Hubert Humphrey, the Democratic nominee, earned a 61 on the thermometer test, a favorability scale from 0 to 100 in the American National Elections Studies. Johnson was nearby with a 58. In 1988, Republican nominee and Vice President George H.W. Bush was trying to take over for President Ronald Reagan. Reagan was fairly popular, and the economy was doing well. Both earned a 60 on the thermometer test. The 2000 election is perhaps the most interesting because Vice President Al Gore, the Democratic nominee, was critiqued for not embracing President Bill Clinton’s legacy. Clinton, of course, was still dealing with the fallout from certain dalliances. For all of Gore’s running away, his thermometer rating of 57 was just 1 point above Clinton’s 56. Republican John McCain in 2008 is the lone exception. His thermometer score was 52. President George W. Bush’s was 40. Could Hillary Clinton pull off what McCain did? It’s possible. Clinton had a well-formed public profile before Obama came on the scene; she’s not running in Obama’s shadow. In addition, we don’t have a ton of data points here — just a handful of elections. So we can’t make any hard and fast rules. That said, McCain was an unusual case. He, unlike Clinton and everyone else on this list, did not serve in the incumbent president’s administration. McCain also had a considerably different ideological profile from Bush. Obama’s and Clinton’s are similar. Chances are that the current polling will hold. Clinton’s fate will more or less be tied to Obama’s popularity and the factors that determine it. Any difference will be small, though in a very close election perhaps a small difference is all she’ll need.